Santa’s sleigh is one of our favorite Christmas charms! Few things are as symbolic of Christmas in Western culture as Santa traveling across the dark winter sky in his sleigh pulled by reindeers. He supposedly travels from the North Pole and delivers packages all over the world, although his home base varies depending on where you live: in Denmark, everybody knows he lives on Greenland, in Finland, he calls the mountain Korvatunturi home, and a few years ago, a Swedish company determined that Kyrgyzstan would be the ideal location for him, based on the rotation of the earth and where the majority of people are located. 1. Three-dimensional 9ct gold sleigh charm by Hockley Jewelry. 2. Sterling silver charm bead with a pink cubic zirconia. Fits Pandora, Chamilia, Biagi, Trollbeads and other 3mm and smaller European bracelets. Sleigh charm bead by Everbling. 3. Discontinued Pandora “Dashing ThroughThe Snow” charm. Sterling silver sleigh with a teddy bear and a 14k gold heart. Retired Pandora charm bead from Pandora Angels. 4. Vintage (1960s) sterling silver disk charm with a 3D sleigh decorated with rhinestones. Sleigh charm from Klines Jewelry. 5. Stainless steel bangle with a pewter enamel sleigh charm and a hand stamped “believe” charm. Bangle charm bracelet by My Initial Charm. 6. Basketweave textured sleigh carrying a pine tree. Three-dimensional antiqued sterling silver sleigh with tree charm by Brown County Silver. 7. Sterling silver and enamel dangle bead charm compatible with Pandora, Chamilia, Biagi, Trollbeads and other 3mm and smaller European bracelets. Santa’s sleigh charm by Bling Jewelry. 8. Vintage 14k yellow gold sleigh charm from MS Jewelers. 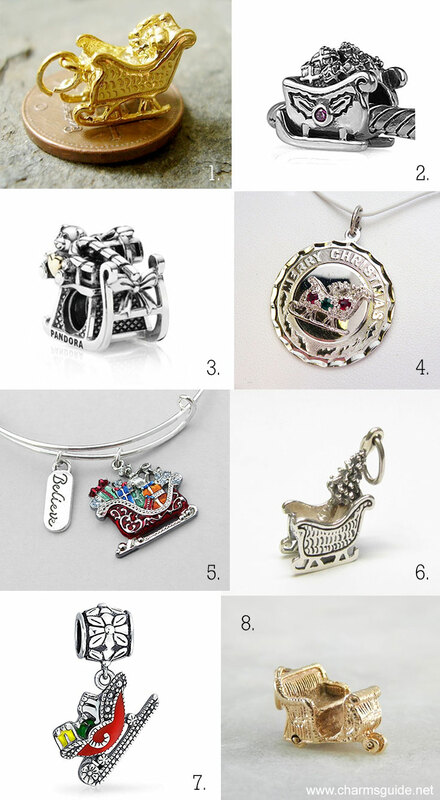 For more Christmas-related charms, also see our Christmas Tree charms post.